This month, the ongoing Batgirl story arc, "Wanted," is interrupted for a 1-shot "Batman Zero Year" tie-in. This issue is written by a fill-in author, Marguerite Bennett. It chronicles the story of Barbara and James Gordon trying to make their way through a Gotham City that is seeing a hundred-year storm and starting to flood. First, Babs is mugged after buying bread and gas, although she gets away and makes it home with her supplies. Then her father goes out to do his job, and leaves her home to protect James. It's not long before the fire department shows up and tells the Gordons to evacuate, as they are in a flood zone. They relocate to a fire house, but that then floods as well. Babs helps get everyone onto the roof, but then one of the survivors betrays them, trying to make off with all their supplies. Barbara manages to take him down and then helps get the rest of the refugees to safety as the storm only gets worse. The writing in Batgirl takes a nose-dive every time Gail Simone doesn't write it, and this issue is no exception. 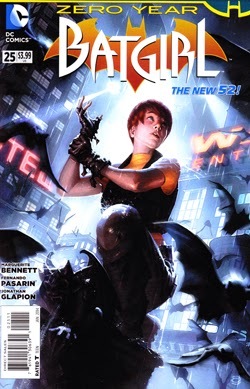 Bennett's story goes basically nowhere, and contributes not one bit to the backstory or character development of Batgirl. This is perhaps unavoidable, as Bennett has nothing to do with this incarnation of Batgirl, and Gail will be back in the very next issue to take over again. The story has very little to do with Batman's "Zero Year" other than being set in the same time period, as Batman never once appears in the issue. In terms of the story itself, the dialogue is very awkward in spots, and the narration, supposedly in Barbara's voice, sounds nothing like the Barbara that Gail Simone has cultivated carefully for two years. But probably the worst part of the story is its predictability. Most particularly, when Henry the refugee tells everyone to throw their bags over to him and then jump across to his building, I immediately thought, "Watch, as soon as he has all the bags he will make off with them." That's exactly what he did. This was not even slightly surprising and one wonders why the characters were all stupid enough to actually listen to him. Although he's right, that jumping with their bags would be harder, why in the world would everyone throw all the bags over first and then jump? Why not have person 1 throw his bag, then jump, followed by person 2 throwing it, then jumping, and so on? There is absolutely no good reason to all throw their bags first without anyone jumping, except that the author needed it to happen. This is a good example of an "idiot plot" (or at least an idiot plot element) -- it falls apart as soon as the characters stop acting like idiots. The worst element of this issue was the whole "Zero Year" tie-in. These mega-crossover tie-ins are bad enough when they happen, but to have it interrupt the current, important Batgirl storyline ("Wanted"), which is 1 issue from concluding, is simply indefensible. This cheap and obvious marketing ploy will sadly work, in all likelihood, because comic-book fans are suckers and they will buy anything that ties into Batman, no matter how tangentially. I only bought this issue because it's part of an ongoing series I collect, and I hate having gaps in my collection. But as Batgirl fare it is utterly worthless. It adds nothing to the Batgirl story, and is poorly written to boot. The art is mediocre, as Pasarin's art usually is. In several panels, between poor writing and confusing artwork, I couldn't tell what was going on. That's a bad job by the creative team, as it should always be clear to the reader what is happening in a given panel. I honestly don't care for how Pasarin draws Barbara's face, either. I'm much more partial to how Adrian Syaf used to draw her. Overall, this is a weak issue that does not live up to the standard quality of the Batgirl series. It fails across the board -- as a Batgirl story, as a Batman tie-in, and just in terms of the basic plot. In future days when I re-read the whole Batgirl series, I probably will not bother to pull this one out of the bag and re-read it.